Vampires. They are the most elegant of monsters—ancient, seductive, doomed, deadly. They lurk in the shadows, at your window, in your dreams. They are beautiful as anything you’ve ever seen, but their flesh is cold as the grave, and their lips taste of blood. From Dracula to Twilight, from Buffy the Vampire Slayer to True Blood, many have fallen under their spell. 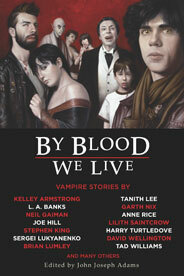 Now acclaimed editor John Joseph Adams brings you 33 of the most haunting vampire stories of the past three decades, from some of today’s most renowned authors of fantasy, science fiction, and horror.